That was the headline in the Deer Lodge Weekly Independent newspaper on August 28, 1868. 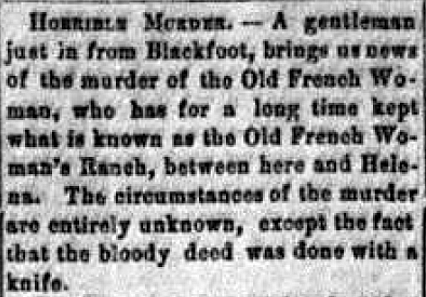 A traveler, just arrived from the Blackfoot, told of the killing of the “Old Frenchwoman,” a well-known character in the Territory, who operated a hostel between Deer Lodge and Helena (at what is now known as MacDonald Pass). The victim was Madame Guyot, the wife of a French Canadian by the name of Constant Guyot. The weapon used in “the bloody deed” was said to be a knife. In late 1866 the Montana Territorial legislature authorized Mr. Guyot to build a road along the Little Blackfoot river near Elliston (at the time, private toll roads were common, as the new Territory couldn’t afford much road building). The new road would be a more direct way to cross the mountains from Missoula or Deer Lodge, than the older Mullen Trail. From the beginning, there was controversy. Jon Axline, in his book “Taming Big Sky Country: The History of Montana Transportation,” said Governor Clay Smith was outraged that Guyot would be allowed to collect tolls before the road was built. The road became known as “The Frenchwoman’s Road” since Madam Guyot was in charge of collecting the tolls and also ran a tavern and lodging house, where travelers could get a spot on the floor to sleep and a meal for three bucks. Gold dust was the currency used, and the Frenchwoman was said to squirrel it away, hidden from her husband. At the scene, investigators found a dining table set for two, the house ransacked, the victim’s bed ripped apart and trunks opened. It appeared to have been a robbery. Many believed the husband did it. A reward was offered, but no one was never arrested. Everything else was speculation and rumor, transitioning to folklore over the years.. There were tales that Constant Guyot (who soon left the Territory) had later admitted killing his wife, and of course, in short order, folks began saying the hostel was haunted by the spirit of Madam Guyot. After the murder and Constant Guyot’s departure, operation of the toll road fell to one of Guyot’s employees, Elijah Dunphy. Sometimes I’m amazed and more than a bit embarrassed at what I don’t know about Montana. I was born and raised in the state, left for 20 years pursuing a journalism career, then returned in the early 1980s. I’ve driven over MacDonald Pass to Helena countless times, including recent trips to the State Historical Society’s archives. Yet, I never knew the stories and legends about the road until reading that old newspaper article from 1868. When Montana became a state, toll-road-deals were revoked. The MacDonald Pass road fell into disrepair until the early 20th century when prison labor was used to make necessary repairs. Then, in the 1930s, the road was totally reconstructed and in the 1970s widened to a four-lane affair. Jim Harmon is a retired journalist whose 50-year career included nearly three decades at KECI-TV, Missoula in roles ranging from news anchor to weather forecaster. In retirement, Jim is a landscape gardener and history buff who’s spent years reading historical micro-film newspapers. You can read his weekly history column at the Missoula Current.